Last Saturday was the day of the move but what also happened on Saturday has been on the news a lot here but I'm not sure how international the news is. There is a mountain/volcano that is quite close to where I live called Mt. Ontake. It randomly erupted while I was moving houses and it has been the cause of quite some strife here lately. There have been over 40 deaths so far and the volcano is still spitting out a lot of gas. There are a whole heap of people working to find bodies on the mountain even though it's pretty dangerous. That's been the main thing on the news lately besides the usual typhoon warnings. Sunday was a big day. A very long day. I got up at 4:30 am for a karate tournament. I wasn't even fighting today! I met Fuyuki at 5 and we drove to Sensei's house. We then drove to a town called Toyota which was in a different prefecture so it took quite a while to get there. I slept in the car. We get to this big stadium and there are hundreds of people dressed up in the karate whites. I met this really tall guy who happened to be an English teacher so we had a good talk. Inside the venue was chaos. This tournament was for Junior high school kids and younger so there was a lot of children running around screaming. Us non competitors were here to staff the event. I was mainly going to be a time keeper but I also got to do some judging. But before any fighting could start, we had to do the opening ceremony. Which whilst we had to sit in seiza (kneeling) for aaages, it was quite fun. The guys who were running the warm up made it quite a laugh. We were doing odd star jumps and all sorts of weird stretches and the kids loved it. It was great to see their nerves go away before their fights and smile instead. It made the atmosphere lift and it was cool. I got to my court and sat down ready to do some stop watching. And I did. For about three hours. I had a small break and then got back to it. We even had lunch at one point. And then back to the stop watching. I got to take some time off to watch the kids from my dojo fight which was awesome. We had some winners and a few close loses but it was a good day. I got to be a corner judge and it was actually quite fun! I was nervous at first because it is quite an important job. Well, it's more important than time keeping I think. Also, the fights I judged were the semi finals so there was a bit of pressure. There were some good fights and some that were hard to call. There was also a division for "pre-school girls." Which had to be the cutest thing. But soon enough the day was nearing a close. There were just a couple of finals left and one of our fighters was going to be fighting. He unfortunately lost on a foul but would have won if that wasn't the case. But he got runner up which is still pretty impressive seeing as he was in a division of over 30 people. It was all over at about 5:30 pm and we had only the closing ceremony and cleaning. We knelt for aages and it was quite painful. Everyone was shifting uncomfortably as the speeches droned on. But it got fun again! After the clean up most people had left. I was standing around with Fuyuki and we thought some light sparring would help pass the time. So we started doing that when some higher grade came over to talk to me. He asks me: "Do you know 'Kyokushin karate?'" I said: "Yes, actually, I do Kyokushin!" He said my fight style was very 'Kyokushin-ish'. He then told Fuyuki (jokingly) to watch out because I was a spy. It was quite funny. I was surprised that he noticed my fight style. I guess it's a bit like an accent when speaking. It was about six when we hit the road. I was the first one to sleep in the car. I woke up and we were at a restaurant on the hunt for ramen. Soon enough we were home and it was late. I went to bed at about 12 and of course there was school the next day. School was pretty normal. I got a normal amount of study done. Kendo was good too. I got smacked on the head a couple of times but I've learnt to deal with that pain now. Tuesday was a good day for karate. But also a painful one, as per usual. There is only about six weeks until the all Japan tournament so it's getting pretty tough. Fuyuki and I were battling it out as we normally do and today I wanted to use my knees a bit more. I was eyeing up his sides, looking for an opening when he slipped one of those damned punches into my ribs. It really hurt and I didn't do a very good job of hiding it. He came in, looking to punish my weakness when I panicked slightly and started throwing knees everywhere. He had to back off because if a knee hits true, it hurts like anything. I decided to follow him and I managed to slam one into his right side. I felt my knee make contact with his ribs and he hit the deck. We laughed it off and got back to fighting. We later did some high kick training. Fuyuki and I weren't wearing gloves or shinpads so it was straight bone to hand. We weren't kicking full power because that would be dumb. But we were trying to catch each other's kick and throw it down. This works well for a front kick but we wanted to do it for high kicks too. Sensei said that it would be impossible if the kick was at full power. Fuyuki lines one up and lets loose. I mucked up my hand positioning. Instead of catching the kick with both palms, I turned my right hand sideways and caught his shin on the edge of my hand. I thought my hand broke but it was fine. It just hurt like hell. I had to get him back. So we had one last fight before class finished. I managed to nip his cheek with my foot but it wasn't enough to hurt. We traded punches and I landed a couple of good kicks on his leg. It was a pretty even fight but the call went my way. I thought it was a draw though, my ribs still hurt a week later. I got home and lay down to die. I had dinner and lay back down again, I was so tired. 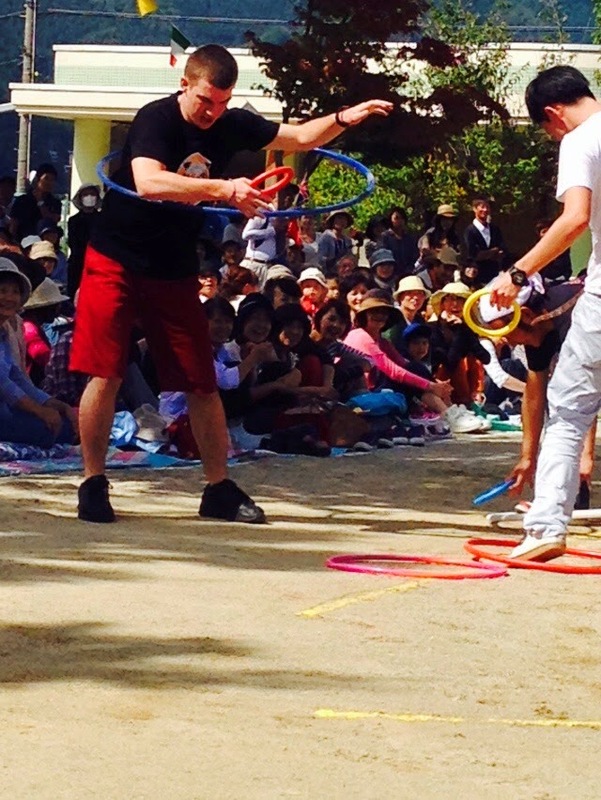 I went to bed and enjoyed a sleep in because I was taking a day off to watch my host niece's kindergarten sports day. We went along and watched these wee kids run relays, do funny dances, play games and all sorts. It was great fun! My four year old host niece, running like a champ! The adults even got to participate in this one relay. It was a quite a laugh. It was an awesome day and once the main event was over, we went out for a picnic in the nice weather. We all went home and had naps until dinner time. I probably should have done something productive but my room was so warm and my bed so soft. I wasn't able to do kendo on Thursday on account of my sore hand so I waited at school and got some jobs done. Of course I went to karate though! I had some noodles before I went which is pretty risky. If a punch were to slip my guard then those noodles would evacuate my stomach pretty quick. I was so hungry I decided to risk it. And everything went fine! It was good to sweat it out while fighting. Still one of the best feelings. Friday was a good day but I was quite tired again. In P.E, my team won a game of volley ball which was pretty cool. We don't normally win so we were extra happy. Kendo was tough. I got a really sore head but once again, I'm getting used to that. My feet hurt and my hands were raw. I was sweating like a pig but it was the best feeling to take off the helmet at the end of the session. I got home to find Kotoha, my seven year old host niece asleep in the lounge. She promptly woke up and got her English study materials out. So after dinner I helped her with some study. It was awesome fun! I was also casually writing a speech for this meeting on the 18th. It's gonna be in front of around a thousand people apparently and I thought I had plenty of time to write it. I've already written half of it and it's looking fine. But we got a fax tonight (yes, people still fax here in Japan.) And it was requesting that I submit my speech by the 10th to make sure it's legit. This is a pretty official meeting it seems. So that's fine and all, still plenty of time. Except I got this message on the 4th. On the 6th I'm going to Okinawa on the school trip (if the typhoon doesn't wreck it first) and I get back on the 9th. That leaves me with just the weekend to get this done. Oh dear. So I went to bed with a whole lot of stuff running through my head. I've got to write this blog before it is too late, I've got some Rotary things to get done, I've got to write something for the paper, I've got to write this speech and memorise it, I've got to pack my bags for Okinawa too. Busy busy. I still had a big sleep in though, can't write anything if I'm tired. I had breakfast and went to the clinic to get my hand x-rayed, Turns out I just need to harden up as is always the case. We then stopped off at this wee cake shop and picked up the most amazing looking cakes that I forgot to get a photo of so you'll have to take my word. The shop ladies said my Japanese was amazing and it was nice. I am really stoked with my progress. It motivates me to study more! I'm not gonna lie, I got home and all of my time disappeared and soon enough we were having sushi for dinner. Woops. After dinner I went up stairs to get some work done but I sat down on the bean bag and opened up my laptop when the door bell rang. I live on the third floor so I'm quite a ways from the front door. But I heard the chime and the door open. Then there was Kotoha's voice and she said: "Is Brennan home??" It was loud enough for me to hear it on the third floor. Next thing I hear is the frantic thumping of someone running up the stairs and Kotoha and her wee sister laughing and giggling. I was dragged down stairs and it was just too cute. They soon had to go home but it was real nice to see them. My host Dad gave me this look and then asked if I was still hungry. I grinned and said of course! So we went out for ramen. I love noodles so much that I'll even eat egg to get to them. So at this ramen shop, they only have one flavour of ramen. Instead of picking a different flavour or something like most other shops, at this one you choose how spicy the noodles are. They have no spice, mild, medium, spicy, 'especially spicy', 'mega spicy' and 'super mega spicy'. If you eat the super mega spicy noodles you get your photo taken and it gets put on the wall. I looked at the wall and there were no foreigner's photos there so I decided to become the first one to do so. But this time I settled for medium noodles to gauge how strong I am. We're gonna come here a few more times and build up my 'spicy' resistance so I can tackle the hottest they've got. We got home and had those cakes and watched a movie on TV. I went to bed still thinking about all the stuff I've got to get done. So that's what I've been doing today! And I'm pleased to have gotten this blog done, I'm all packed for Okinawa and all I've got to do is the speech for now. I've also just found out that I'm going to be the only one do a speech at this meeting. I'm a bit nervous to be honest. Should be right though, I've just got to smile and pretend the crowd isn't really there. I'm tired but happy. I'm a lot less stressed than I have been over the last few weeks and I'm feeling good. I'll be in Okinawa from tomorrow till Thursday and there is a big festival to go to on Friday so it's gonna be pretty busy.